Wilhelm 'Willi' Batz was born on 21 May 1916 at Bamberg. He entered the Luftwaffe in 1935. He trained as a fighter pilot but was assigned instructing duties from 1937. He was promoted Leutnant on 1 November 1940. His repeated requests for a transfer to combat duty were rejected. After 5,000 flying hours instructing at the flying school at Kaufbeuren and the fighter pilot school at Bad Aibling, Batz was finally transferred to 2./Ergänzung-Jagdgruppe Ost to undergo operation training on 20 December 1942. On 1 February 1943, Batz was appointed adjutant to Johannes Steinhoff (176 victories, RK-S) in II./JG 52 based on the Eastern front. He did not score his first victory until 11 March 1943. He was appointed Staffelkapitän of 5./JG 52 in May 1943, by which time he had seven victories to his credit. On 9 September, he claimed his 20th victory. His 40th followed on 16 November and his 50th on 30 November. By the end of 1943, Batz had 75 victories to his credit. Batz fell ill in February 1944 and was grounded for two weeks. On his return he became spectacularly successful. He recorded his 100th victory on 22 March 1944. Oberleutnant Batz was awarded the Ritterkreuz on 26 March 1944 for 101 victories. 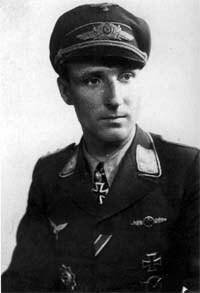 On 19 April, Batz was appointed Gruppenkommandeur of III./JG 52, taking over from Major Günther Rall (275 victories, RK-S). He was operating with such luminaries as Hauptmann Erich "Bubi" Hartmann (352 victories, RK-Br), Oberleutnant Friedrich "Fritz" Obleser (120 victories, RK) and Oberleutnant Walter Wolfrum (137 victories, RK) among the high-scoring pilots of III./JG 52 at that time. Throughout the summer of 1944, he was downing three or four Soviet aircraft a day. He downed 15 enemy aircraft on 31 May 1944 to record his 141st through 155th victories, scoring these victories on seven separate missions. In June he was to combat USAAF aircraft over Rumania and recorded two P-51s and a B-24 during this time. Hauptmann Batz was awarded the Eichenlaub (Nr 526) on 20 July after 188 victories. His 200th victory was gained on 17 August 1944. By the end of 1944 Batz had shot down 224 enemy aircraft, including six for his 204th through 209th victories on 22 August. Batz remained in command of III./JG 52 until 31 January 1945 when he was transferred to take command of II./JG 52 in Hungary. Major Batz was awarded the Schwertern (Nr 145) on 21 April 1945. At war's end he was able to extricate his Gruppe from Hungary via Austria, and return to Germany. He was thus able to elude Soviet captivity that befell the other two Gruppen and the JG 52 staff. Post-war "Willi" Batz joined the Bundesluftwaffe and retired an Oberst. He passed away on 11 September 1988 at Mauschendorf in Unterfranken. 'Willi' Batz flew 445 combat missions in scoring his 237 victories. 234 victories were achieved over the Eastern front, including at least 46 Il-2 Sturmoviks, but he did claim three victories, including one four-engine bomber over the Western front. He was wounded three times and was shot down four times.